The Daily Clog » Dear Freshman and Junior Transfers, Free Stuff! Dear Freshman and Junior Transfers, Free Stuff! Oh, to be a freshman again when it seemed like the free things would never end. 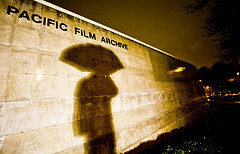 The Berkeley Art Museum and Pacific Film Archive will be hosting an event which features free pizza and classic art posters this Thursday, August 25 at 7 p.m. Not only freshman, but incoming transfers can get into the event free of charge with an official Cal I.D. After this, students as well as the public can enjoy a free movie screening. Sci-fi movie “It Conquered the World” will be shown in the sculpture garden, providing a quaint little environment in which to see the movie. Students will also be able to ask members of the BAM/PFA Student Committee questions about the museum, as they will be present at the event. So take advantage of your first year, opportunities for free pizza sadly diminish as time goes on.